This thread includes a variety of personal resources gathered since 2009 and is a work in progress. I add to the map, mosaics and reports after each trip. The most recent route mosaic/line is featured at the bottom. Where else can you go in New York that is so remote, rugged and beautiful? Surprisingly clean stone is the reward for an arduous approach. The most logical approach is from the Garden in Keene Valley which places the mileage between 8.5 and 9.5 miles to get to the base of a given route. As a dayhike, you’ll amass nearly 19 miles, 5,000 feet of elevation gain over 13-22 hours (our fastest time was 11.5 hrs.) depending on conditions (yours and nature’s). 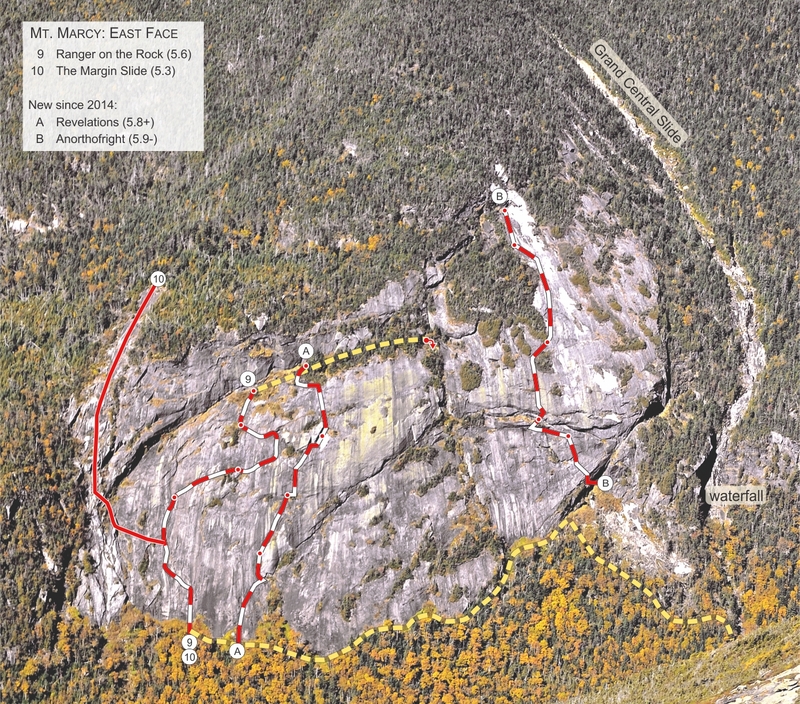 There are a total of 60 routes in Panther Gorge; 52 new routes have been added on Marcy and Haystack during the last few years including 18 ice climbing routes. Rock climbing routes range from 5.3 to .10a YDS with most falling between 5.7 and 5.9. Ice routes range between NEI2 and NEI5- with the majority of climbed routes in the 3-4 range. Locations vary with some of the best and longest rock climbing routes in the Huge Scoop (opened in 2015) and Agharta areas. The southernmost route on Mt. Marcy is on the East Face slab. The 10 new routes on the Haystack side include a fingercrack up a free-standing pillar at the north end (probably the one described by Orson Phelps when he guided S.R. Stoddard in the late 1800s) to an easy crack far to the south. Descriptions are below. A few may be found in Adirondack Rock edition 2. All are listed on MountainProject.com and Adirondackrock.com (links below). The Secrets of Panther Gorge gives a little more information and describes the layout of the gorge via a walking tour, if you will. This is more from a bushwhacking than climbing perspective. For something totally different and subterranean, read Bob Carroll in Panther Gorge. A few tips-stay out of the center of the drainage stream at the north end descending, allow at least 3-4 days of sunny weather before attempting a rock climb, don’t bother hitting the gorge until June unless you want to tangle with seepage and rotten snow, don’t fall in the man-eating holes between the moss-covered talus. The ice lines on the slab are generally south-facing and prone to delamination so early winter after a few days of overcast weather is optimal. This is more of a personal preference--you may want to climb in pants and bring tape, some of stone is razor sharp. History that includes FA information, location, length and grade of each route in excel format. 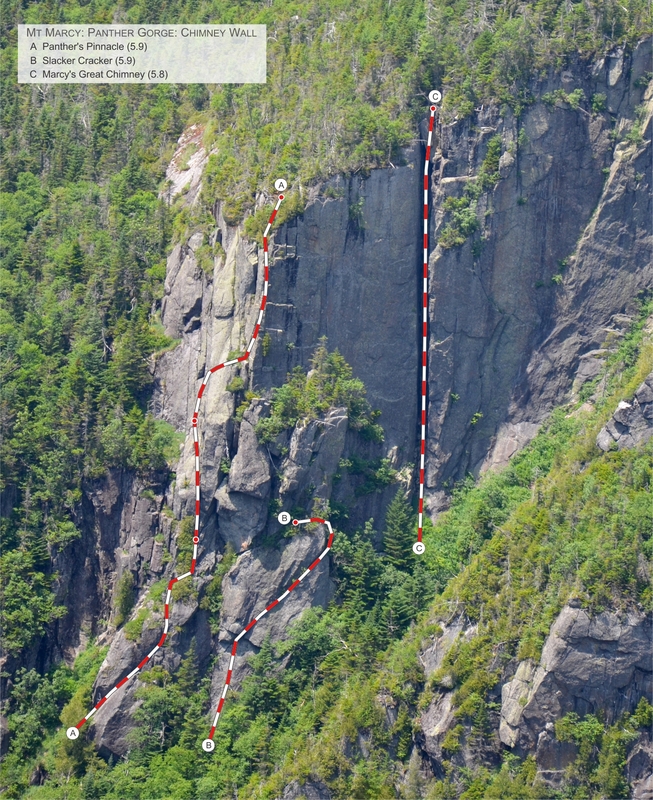 Each new route with mosaic photos (aerial with inset details) may be found at Mountain Project & Adirondack Rock . Google Earth KMZ file-Locations and brief descriptions of the cliffs and other notable climbing features. Aerial of the gorge with almost 100 pop-up photos when you click specific areas. Not all photos are of climbing, some include pics in the talus or of interesting areas encountered during bushwhacking. High resolution distance photos or aerials with inset detail photos and route line may be displayed or downloaded. This also includes about 70 slides, but you may display by filename and scroll to the technical lines. Each route begins with panther_gorge. 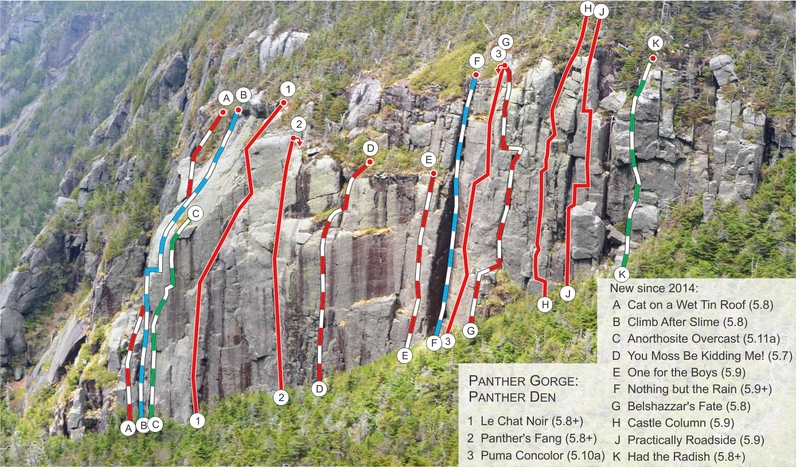 The naming convention generally follows this layout: “panther_gorge_AREA (Marcy or Haystack)_ASPECT_ROUTE NAME.jpg” . Rather than add individual trip reports to this forum section, I’ve included links to each for those who are interested in a narration, photos and sometimes video. Haystack (V Wall)-Psalm 23 & Windjammer (w/John Pikus & Jaryn DeShane) 2016 September 17. Haystack (North End)-Kitty Cake (WI2) & 2nd ascent of By Tooth and Claw (Marcy) (w/Doug Ferguson & Walker Wolf Bockley) 2017 January 14. Marcy (Feline Wall)-Chimaera (WI3-) (w/Matt Dobbs & Jace Mullen) 2017 February 18. Haystack (North End)-Ride the Lightning (WI5-) & Skip the Lightning (WI3-) (w/Alan Wechsler) 2017 March 10. Marcy (Chimney Wall)-Slacker Cracker (5.9) (w/Adam Crofoot & Jaryn DeShane) 2017 June 3. Marcy (Chimney Wall)-Marcy's Great Chimney (aka Empty Tomb) (5.8) and All Ryled Up (5.7) (w/Jaryn DeShane) 2017 June 15. Marcy (East Face)-Anorthofright (5.9-) (w/Steven St. Pierre) 2017 August 27. Marcy (Chimney Wall)-Panther's Pinnacle (5.9) (w/Steven St. Pierre) 2017 September 16. Marcy (Chimney Wall Area)-Spiritus Draconis (WI4+) (w/Jaryn DeShane) 2018 February 1. Marcy (Huge Scoop)-Charybdis (WI4) & Scylla (WI4) (w/Laura Duncan & Brent Elliott) 2018 February 17. Haystack (V Wall)-John 3:16 (WI4) & PG-13 (WI4) (w/Loren Swears) 2018 March 24. Marcy (Chimney Wall area)-Apex Predator (WI4-5) (w/Aaron Courain & Alan Wechsler) 2019 January 5. Sorry, Kevin (WI4) - FA by Charlie Beard, Jesse Colangelo-Lillis & Matt Dobbs on 2016 Feb 28, 2016. Needle in a Haystack (Tiers of Haystack S. of the Ramp Wall) - FA Doug Ferguson & Walker Wolf Bockley 2017. 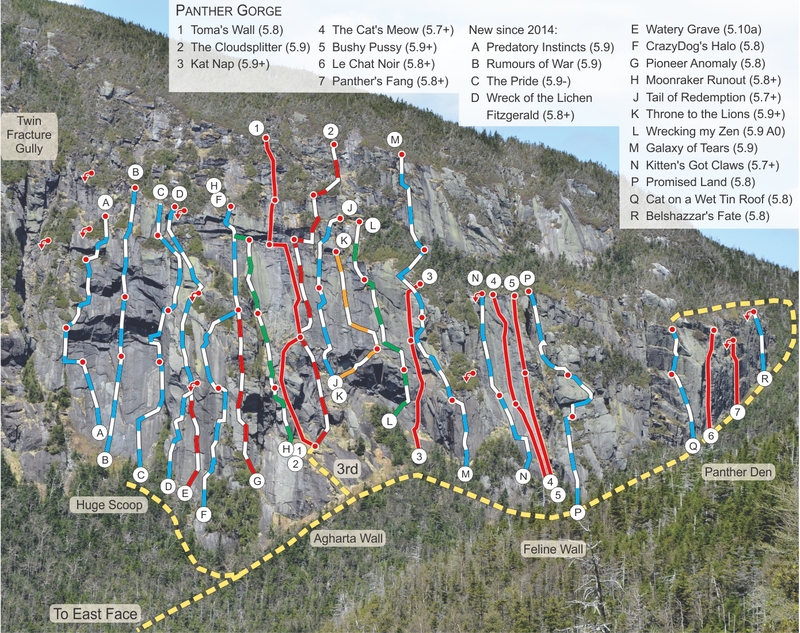 "New Highs: Backcountry Climbing in Panther Gorge." MacKenzie, Kevin. Adirondack Life 2016 Annual Guide to the Great Outdoors. 10-13. Print. "Panther Gorge rocks." Wechsler, Alan. Sept/Oct Adirondack Explorer. 58-61. Thanks to all the bushwhacking and climbing partners (a unique brotherhood) who have made the adventures a success over the years—Adam Crofoot, Bill Schneider, Anthony Seidita, Mark Lowell, Greg Kadlecik, Scott van Laer, Allison Rooney, Hunter Lombardi, Justin Thalheimer, Dan Plumley, Devin Farkas, Nolan Huther, Alan Wechsler, Dustin Ulrich, Loren Swears, John Pikus, Jaryn DeShane, Doug Ferguson, Walker Wolf Bockley, Matt Dobbs, Jace Mullen, Steven St. Pierre, Ken Hebb, Aaron Courain! Special thanks to Don Mellor and Jim Lawyer for their support and interest! Also thanks to my cousin Ed Tuttle for inspiring me to higher places! Above, Adam Crofoot leads Pi Day-March 2015. Mind boggling! Great work Kevin. Thanks so much, it's a labour of love! See above for new ice route details - By Tooth and Claw (WI4), 250'. Last edited by mudrat; 02-04-2016 at 11:08 PM..
Two Haystack ice climbing routes put up on March 5 - See #21 above. Added a new route under "Additional Routes". This WI4 one was put up by Charlie Beard, Jesse Colangelo-Lillis & Matt Dobbs on Feb. 28, 2016. Added two 5.8s to the Agharta and Panther Den Walls - Pioneer Anomaly & Belshazzar's Fate. See # 22 in the list. Added a 450' 5.9 in the Huge Scoop on Marcy with Bill Schneider/Nolan Huther. See #23 in the list above. Added the 600' 5.9 Galaxy of Tears on Mt. Marcy's Feline Wall on June 17th with local Dustin Ulrich. See #24 in list above. Another installment-Added One for the Boys (5.9) on the Panther Den on June 25th with Allison Rooney, Adam Crofoot and Bill Schneider. See #25 in the list above. Also embedded routes courtesy of ADK Rock-Thanks Jim! Links to ALL Route Line Photos from 1965 to the present (including separate overviews of Haystack and an aerial layout of Gorge). Thanks to Jim Lawyer for the vector art! Added a new route: Tail of Redemption to the Agharta Wall on July 30 with Bill Schneider & John Pikus. Good times and no blackflies! See #27 in list above. 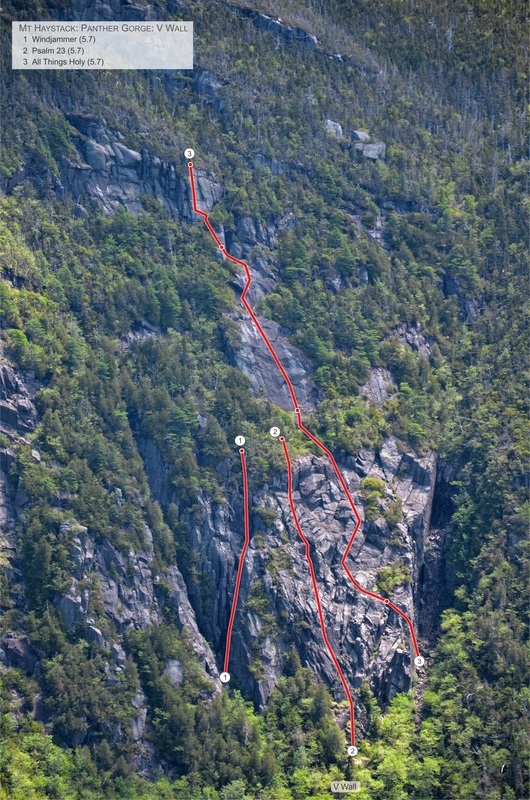 Added a 600' 5.8+X route to Marcy's East Face on August 27th-Revelations. See #27 in the list above. Added 2 new Haystack routes: Psalm 23 & Windjammer. Both are fun 5.7s. See # 29 above. 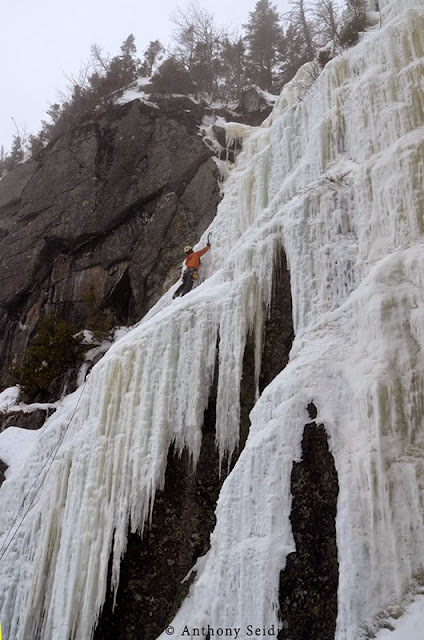 Added a short easy ice route on Haystack (Kitty Cake) and did another ascent of By Tooth and Claw on Marcy. Hopefully the weather plays nice over the next few weeks for another trip or two--the ice is fat! See trip #30 above. We've been after this ice smear for a couple years and finally got it on February 18th. Chimaera 275' (WI3-). See trip #31 above.